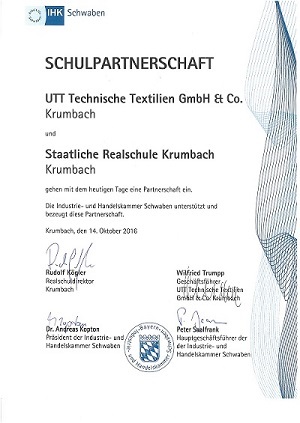 On Friday, Oct. 14, 2016, the cooperation agreement between the secondary school and UTT Technische Textilien GmbH & Co. KG was signed in the “staatlichen Realschule” (secondary school) Krumbach. It is the aim of this cooperation to intensify the partnership with the school and to promote our high tech and digitised manufacturing company by involving the teachers. It is our intension to achieve a certain degree of recognition and brand impact through this contact. We would like to represent our company as an attractive regional employer and to set ourselves apart positively from other competitors. Finally we also expect that one or two trainees, encouraged by the school, will visit our company and will be inspired to go for an apprenticeship in our Company.